Rocky S2V Steel Toe Tactical Military Boot. 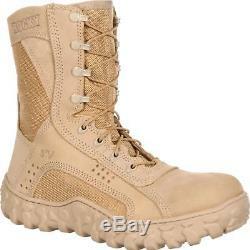 This steel toe military boot is constructed to accommodate any and every challenge a military professional may face. It's a Berry Compliant and Uniform Compliant (AR 670-1) boot, made in the USA. The Rocky S2V Steel Toe Tactical Military Boot is a protective product boasting an expansive set of functional features. Durable is a weak word for this boot's abilities. Made from triple-stitched, flash- and water-resistant leather and 1,000 Denier CORDURA, this boot exhibits exceptional strength. Its lining is made from wicking Dri-Lex and reinforced with an Aegis Microbe Shield for long-term endurance. A tongue thoughtfully crafted from Lycra fiber is longer-lasting and more flexible than what you'll find elsewhere. Rocky carefully considered the duty of this boot and equipped it with the qualities to exceed expectations. You can work hard worry-free, knowing your feet are fully protected. The boot is PTFE coated for flame-resistance and meets ASTM F2413 protective toe classification. Its SuperFabric instep panels prevent early boot failure from rope burn, while Roll-Stop Ankle Stability reduces your risk of injury. Don't let a lesser boot sacrifice your safety and compromise your success. You deserve a combat boot to support you with each and every step. Comfortable feet are integral to a job well done. Proprietary high-walled Vibram soles, a perforated Air-Port cushion footbed and PU midsoles provide the significant relief you need to overcome obstacles and achieve your personal best. Advanced S2V Sieve technology enhances your comfort, circulating air in and water out. A fiberglass shank removes excess impact and adds extra safety. Rocky strategically designed this tactical boot to boost mobility and advance quick-paced action, using lightweight materials to create a full footwear experience. If you're searching for a military boot to protect your feet and enhance your performance, the Rocky S2V Steel Toe Tactical Military Boot offers all the strength you need. Proprietary high-walled Vibram soles with perforated Air-Port cushion footbed and PU Midsoles. Made in the USA, Berry Compliant. This steel toe military boot was constructed with its task at the forefront of focus. Rocky built the Rocky S2V Steel Toe Tactical Military Boot to withstand challenging conditions and endure years of tough work. Composed of triple-stitched, flash- and water-resistant leather and 1,000 Denier CORDURA, this desert tan military boot is more than just durable. A tongue, intelligently crafted from Lycra fiber is longer-lasting and more flexible than what you'll find in lesser boots. The wicking Dri-Lex lining in this steel toe shoe is reinforced with an Aegis Microbe Shield to provide years of exceptional performance. Rocky sought out materials that were lightweight enough to enhance quick-paced action and strong enough to get the job done. 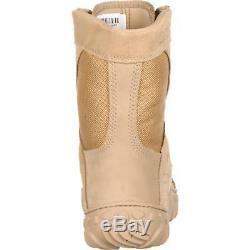 This military boot is PTFE coated for flame-resistance and meets ASTM F2413 protective toe classification. Rocky included SuperFabric instep panels to prevent early boot failure from rope burn and Roll-Stop Ankle Stability to reduce your risk of unwanted injury. You need a boot with the preventative technology to maintain your well-being, so Rocky built one. Comfort isn't compromised in the high-quality construction of this military shoe. Proprietary high-walled Vibram soles, PU midsoles and a perforated Air-Port cushion footbed support your every step. Advanced S2V Sieve technology circulates air in and water out, guaranteeing comfortable, dry feet in threatening circumstances. A fiberglass shank gives you plenty of arch support and additional safety to your stride. 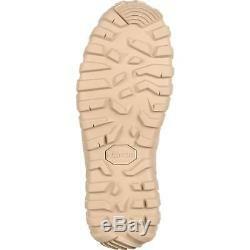 This military boot is Berry Compliant and Uniform Compliant (AR 670-1), built in the USA. If you're after a combat boot that's as dedicated as you are, the Rocky S2V Steel Toe Tactical Military Boot is up for the challenge. 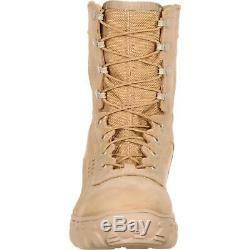 The item "Rocky S2V Steel Toe Tactical Military Boot Lycra Tongue 1,000 Denier CORDURA" is in sale since Wednesday, May 23, 2018. This item is in the category "Clothing, Shoes & Accessories\Men's Shoes\Boots". The seller is "lehighoutfitters" and is located in Logan, OH. This item can be shipped to United States, Canada, United Kingdom, Denmark, Romania, Slovakia, Bulgaria, Czech republic, Finland, Hungary, Latvia, Lithuania, Malta, Estonia, Australia, Greece, Portugal, Cyprus, Slovenia, Japan, China, Sweden, South Korea, Indonesia, Taiwan, South africa, Thailand, Belgium, France, Hong Kong, Ireland, Netherlands, Poland, Spain, Italy, Germany, Austria, Israel, Mexico, New Zealand, Philippines, Singapore, Switzerland, Norway, Saudi arabia, Ukraine, United arab emirates, Qatar, Kuwait, Bahrain, Croatia, Malaysia, Brazil, Chile, Colombia, Costa rica, Dominican republic, Panama, Trinidad and tobago, Guatemala, El salvador, Honduras, Jamaica, Antigua and barbuda, Aruba, Belize, Dominica, Grenada, Saint kitts and nevis, Saint lucia, Montserrat, Turks and caicos islands, Barbados, Bangladesh, Bermuda, Brunei darussalam, Bolivia, Ecuador, Egypt, French guiana, Guernsey, Gibraltar, Guadeloupe, Iceland, Jersey, Jordan, Cambodia, Cayman islands, Liechtenstein, Sri lanka, Luxembourg, Monaco, Macao, Martinique, Maldives, Nicaragua, Oman, Peru, Pakistan, Paraguay, Reunion.